People from Kutch first arrived in Cardiff around 1964 and found jobs in factories and iron foundries. More people came from Uganda and the Kutchi population greatly increased within few years. In order to maintain their religion and culture they used to gather in people's houses or hired church halls to celebrate religious festivals and other events. As there were more people from Kutch in London and North of England, temples were first established in cities like Bolton and London. In 1978, during his tour of UK H.H. Acharya Shree Tejendra Prasadji Maharaj came to Cardiff and was impressed with the gathering of the Community of Satsangis. He suggested that, as there are many Satsangis, a temple should be established in Cardiff and he gave his blessings that this should happen in a short time. True to his word some of the Satsangis gathered at a meeting on 2nd December 1978 and decided to search for suitable premises. An old Jewish Synagogue which was now a printing press was for sale and although a small building, it was found to be suitable for a Temple. In order to proceed further a committee of five trustees and twenty members was elected to draft a constitution and raise funds to buy the freehold of the building. Mr Naran Bhimji Patel was elected the President, Mr Keshavji Kanji Hirani was elected the Vice President and Mr Ratna Murji Hirani was elected as the Secretary of the Temple. The same three still hold the same positions in the Committee. A letter was written to the late Sadguru Swami Hariswarup Dasji, who was the Mahant Swami of Bhuj, in order to seek his blessings. The building was purchased for 22000 pounds and work began in order to convert it into a Temple. 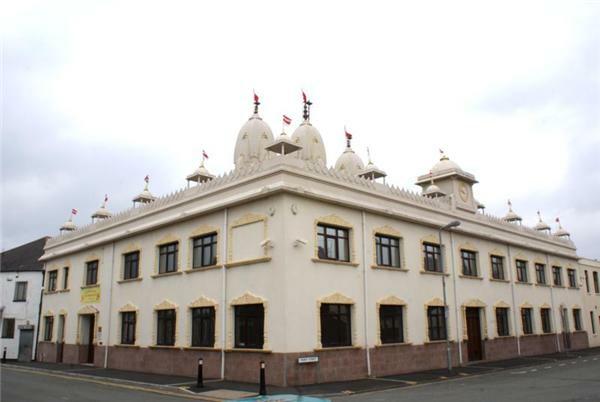 With the permission of Mahant Swami of Bhuj, it was decided that the Temple would be known as Shree Swaminarayan Temple, Cardiff. (Under Shree Narnarayan Dev Temple, Bhuj Kutch). Donation were given by the Satsangis of Cardiff but not enough money was raised through donations so Shree Swaminarayan Temple, Willesden, London was asked to help and provide financial support. The Committee of the Temple gave us a generous loan to buy the temple building and following some alteration to the building the festival of Ramnavmi was first celebrated in the temple building on 6th April 1979. Under the guidance of Mahant Swami of Bhuj murtis of Shahajanand Swami, Narnarayan Dev, Radha Krushna Harikrushna Maharaj and Marble murtis of Hanumanji and Ganapatiji were ordered and they were established in the altar on 25th November 1979. On this occasion a five day Shreemad Bhagavat parayan was organised from 21st November 1979 to 25th November 1979. At the beginning the temple used to open at weekends only but now it was opening every evening. As time went by the number of Satsangis began to increase and many activities were taking place at the temple. One of the prominent satsangis, Mr Keshavjibhai Premji Bhudia of Fotadi, once visited Cardiff Mandir and he offered to pay for a carved wood sinhashan for the Murtis. This offer was gladly accepted and the Sinhashan was made in India and it arrived in Cardiff in April 1982. Once the sinhashan arrived it was decided to install the Murtis on 27th June 1982. At that time news came through that Santos of Bhuj were on their first ever visit to East Africa and they were intending to come to UK. The Committee decided that we must postpone the Murti installation day and wait for the Bhuj Santos to come to UK. Amongst the Santos who came to UK were late Mahant Swami Purani Hariswarup Dasji, Late Sadguru Swami Murlimanohar Dasji, late Shastri Swami Shree Rangdasji and Kothari Parshad Jadavji Bhagat. With their consent it was decided to celebrate the Murti Pratishtha Mahotsav on Sunday 29th August 1982 (on the 10th day of the bright half of the month of Bhadrva). This was a unique day for Cardiff as Santos from Bhuj had ventured out of India for the first time and would conduct Murti Pratistha in a foreign land for the first time. A seven Day parayan of Vasudev Mahatma was organised and Shastri Swami Shree Rangdasji was the main narrator of the scripture. The festival was celebrated with a lot of excitement and many Satsangis from other places in UK came for the celebrations. After the Murti Pratishtha the temple would now open for evening and morning Aarti and Katha Kirtans. On the first Patotsav celebration in 1983, H.H. Acharya Shree Tejendraprasadji Maharaj and Santos from Ahemdavad visited Cardiff and did the Patotsav Aarti. As time went by many Santos from India began to come to UK and used to visit Cardiff and the Satsangis of Cardiff gained benefit of Katha and Sant Samagam. The temple committee members were dedicated people and undertook the running of the temple with great devotion and unity. Their aim was to maintain the religious traditions and culture amongst the younger members of the community. In order to encourage the younger members to come to the temple, sports facilities were provided and the Gujarati and religious classes were started. Trips to seaside town were organised by bus and trains and camps were organised to facilitate character building and leadership qualities. An exhibition on the life of Lord Swaminarayan was organised in the temple and many people visited the temple to see everything that was on display. The exhibition was a great success. As the temple was a small building shortage of space was being experienced, especially by young community members. Many activities could not be undertaken and there was an urgent need to find bigger premises. As luck would have it a two story building just across the road came on the market. It was purchased without delay. The inside of the building was completely gutted and redeveloped to make a prayer hall on the first floor and a smaller function hall on the ground floor. With the help of Satsangis from London all the work was completed and in 1993 on the 10th day of the bright half of Bhadarva, 25th September 1993, it was decided to install the Murtis on the sinhashan which was to be transferred from the existing Temple. Elder Santos from Bhuj as well as H.H. Acharya Shree Tejendraprashadji Maharaj came to Cardiff and a nine day Parayan was organised and everyone from UK and abroad were invited. This festival was quite unique as a procession through the streets of Cardiff was organised on the final day and thousands of Swaminarayan followers took part. The new building included many new facilities including a sports hall for the children and language teaching classrooms and other rooms for Santos to stay. Another ten years quickly went by when in 2003 H.H. Acharya Shree Tejendraprashadji Maharaj came to Cardiff to invite satsangis to his 60th birthday celebrations in Ahmedabad. He learnt that we were planning to celebrate our 25th Silver Jubilee in 2007 and he expressed his wish that as part of our Silver Jubilee celebrations a murti of Baal Swaroop Ghanshayam Maharaj should be installed in the temple. The temple Committee took up this challenge and asked the Mahant Swami of Bhuj, the late Purani Hariswarupdasji to give his permission. Once he agreed everyone in Cardiff was very excited and was looking forward to the day when Ghanshyam Maharaj would arrive in Cardiff. The temple building also needed some improvements such as a lift for the elderly and a bigger prayer hall and a separate sinhashan for the ladies. To include all these facilities it was decided to redevelop the site and a plan was drawn up. Except the ground floor hall where a temporary temple was located everything was demolished and new building work began to take shape. New floors and new roof was built and three beautifully shaped shikhars, one on each sinhashan, were built on the roof. Smaller domes were also placed on the roof parapet to give the building a palatial appearance. New murtis and the murti of Bal Swaroop Ghanshyam Maharaj together with new sinhashans came from India and the Pratishtha Celebrations were arranged from 17th September 2007 to 23rd September 2007. H.H. Acharya Shree Koshalendra Prasadji Maharaj, The former Acharya Shree Tejendra Prasadji Maharaj, Mahant Swami of Bhuj Purani Swami Dharmanandan Dasji and other santos arrived to grace this wonderful occasion. A seven day Shikshapatri Bhashya Parayan was organised with the actual Pratistha and Abhishek day on 21st September 2007. A three day Maha Vishnu Yag was organised and conducted by Shastri Swami Keshavprasad Dasji and the Brahmin priest Gulab Maharaj of Bhuj. A Grand procession through the main city centre was arranged on Saturday 22nd September 2007. Nearly five to six thousand people took part in the procession. This event was like none other and it was well organised, well supported, well disciplined and a very colourful event. Everyone who attended was very pleased to be part of the festival and was quite impressed with the new temple built by Cardiff Satsangis. Since the new temple was opened many visitors and dignitaries have visited the temple. School Children, as part of their religious education, come to the temple to see for themselves what Hinduism means and how the Hindus worship God in their temple. Gujarati and religious classes are regularly held and other education seminars like Diabetic Awareness are regularly organised. In the new temple the Mangla Aarti has been regularly taking place at 07.30 in the morning and the evening Aarti at 06.00 pm. All the festival are celebrated and well attended by all the Satsangis. The arrival of the beautiful marble Murti of Bal Swaroop Ghanshyam Maharaj is the best thing that has ever happened for all the Cardiff Satsangis. The President, Mr Naranbhai Patel, the Trustees, the Committee members and most of all the members of the Building Committee undertook a great project and with the blessings of Lord Swaminarayan and Santos from Bhuj it was completed on time and the outcome was better then anyone can dream of. Twelve months soon went by and the 26th Patotsav was celebrated from 8th to 14th September 2008. A seven day Nishkulanand Kavya Parayan was organised and the Mahant Swami of Bhuj Purani Swami Dharmanandandasji and Sad Guru Premprakashdasji came once again to grace the Patotsav. On 27th September a Gujarati Literature Festival, organised for the first time by the Cardiff Library, was held at the temple. This festival was arranged to encourage Gujarati readers to take up reading and writing of Gujarati. This festival was well attended and many people became library members. The members of the Yuvak Mandal who are the future managers of the temple have worked hard in building the temple and the young boys and girls are now enjoying the hard work of their labour of love, devotion and dedication to Lord Swaminarayn and Bal Swaroop Ghanshyam Maharaj. May Lord Swaminarayan reside in the hearts of all Cardiff Satsangis and in the hearts of all those who come for darshan at the temple.